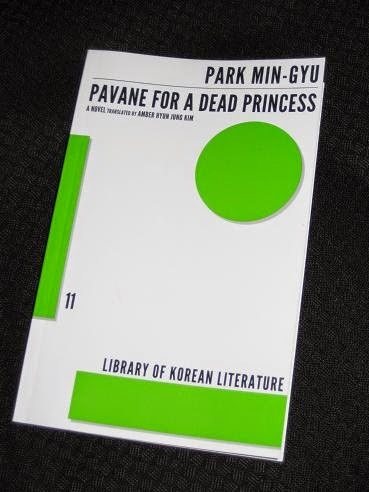 Park Min-gyu’s Pavane for a Dead Princess (translated by Amber Hyun Jung Kim, review copy courtesy of the publisher and the Australian distributor Footprint Books) has a writer looking back to the mid-eighties, a time when he arrived at the threshold of adulthood. The opening scene is of a bus arriving in the snow, bringing the writer (and the reader) to a final, heart-warming meeting between two young lovers. Pavane for a Dead Princess is an easy, comforting read, a story chronicling the development of a relationship against a back-drop of near hedonistic consumerism. The two main characters, young people at odds with society, have arrived in the adult world without the appropriate social tools to survive and ignore outside pressure. It’s hard to follow your own path when countless millions seem to be telling you that there’s only one way to go (and it’s not yours). Having worked hard, the Korean middle classes want to enjoy their gains, and shopping has become a national past-time. In truth, though, they have been swept up in a race to buy more, spend more and become ‘better’, getting into debt in order to have the latest fashions. It’s all seems more like hard work than real leisure. The narrator, his girl-friend and their friend Yohan stick out in this sea of consumerism, all misfits in their own way. The narrator is a budding writer, a school drop-out recovering from the break-up of his parents’ marriage (his actor father dumped the narrator’s plain mother once he hit the big time…). Yohan is the foil to the introverted narrator – he’s clever and witty, and he helps his friend to cope with the daily grind. However, underneath his affable exterior, there’s a palpable sense of darkness waiting to emerge. “Some people might point to handicapped people and tell me things can be much worse. I’m aware there are many people who are in pain. But, although I know this will sound shameless and selfish, there were many times when I envied those people. At least the world recognizes their handicaps for handicaps. The world never accepted my darkness as a handicap, yet everyone treated me as such. My handicap was never recognized as one, although, while I don’t want to admit it, it was the world that had crippled me. I had to go to the same school and wear the same clothes as other kids, but I was always treated differently. I had no choice but to live this life. That was my fate. Even the title is unmistakably Murakamiesque. It refers to a piece of classical music, Ravel’s Pavane pour une infante défunte, music from an LP given to the narrator by his girlfriend on their last night together (a melancholic piano piece). If only Park had Murakami’s sales, I’m sure it would soon be as frequently searched for on Youtube as the Liszt pieces from Colorless Tsukuru Tazaki… or The Wind-Up Bird Chronicle’s The Thieving Magpie!